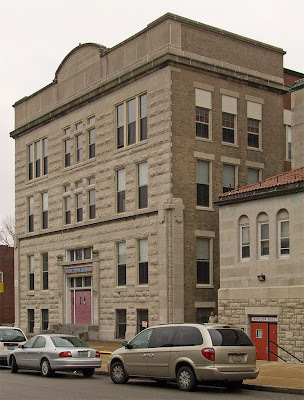 FOLLOWING ARE PHOTOS of Pope Saint Pius V Church, located in south Saint Louis, Missouri, about four miles southwest of downtown. 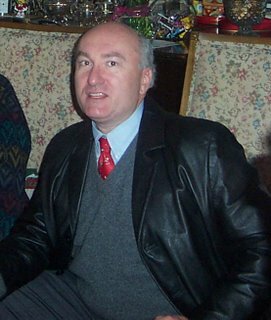 This photo above was taken in July, 2006. The following photos were taken on January 7th, 2007. 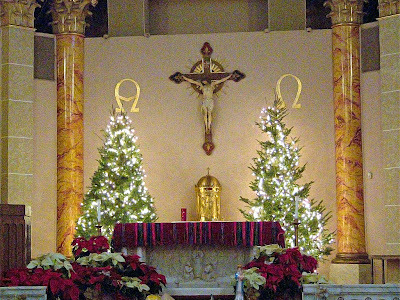 Added to Litany of Our Lady "Help of Christians"
Main altar, decorated for the Christmas season, with tabernacle and crucifix, flanked by the Greek letters, Alpha and Omega. 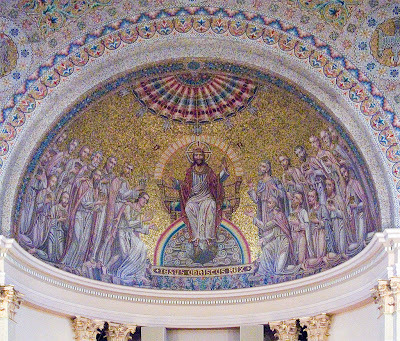 Detail of mosaics above the altar. View to side of nave. 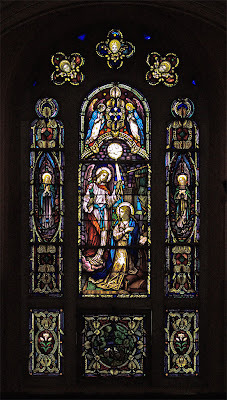 Stained glass window of the Annunciation. 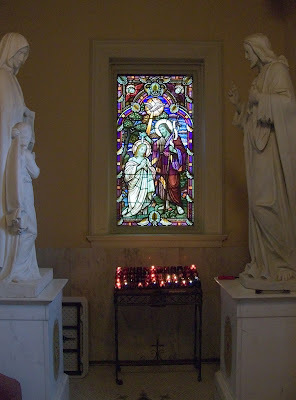 The Angel of the Lord declared unto Mary, "Hail, full of grace, the Lord is with thee." 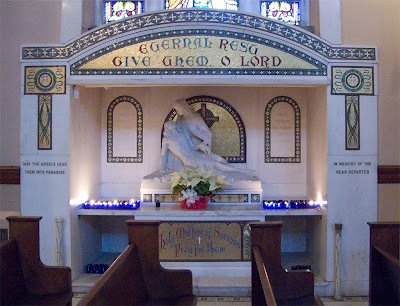 Shrine to the holy souls. Whose Sins You Shall Forgive, They Are Forgiven Them. 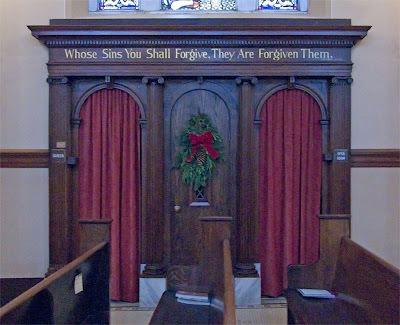 ...and whose sins you shall retain, they are retained. 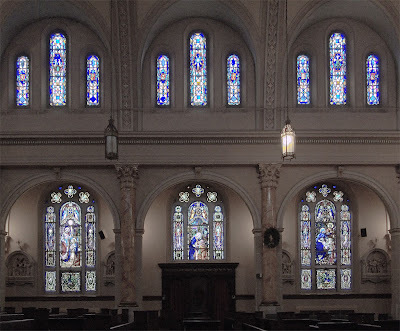 Click here for a good science fiction story about a priest who inadvertently retained sins. 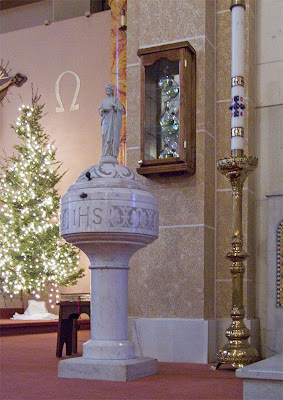 The confessional is a Catholic church's spiritual sewer treatment plant. View of the old school building. 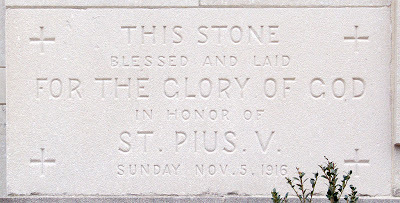 St. Pius V began humbly a century ago as an Irish immigrant church, but by World War II had grown to be one of the largest, most prestigious parishes in the Archdiocese of St. Louis. 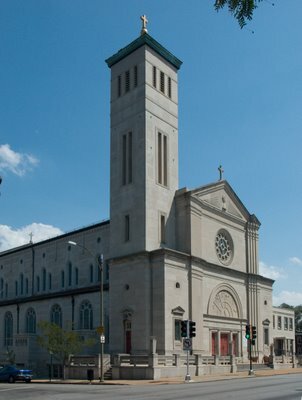 The post-war baby boom swelled its membership and school enrollment, and prompted expansion and improvements of the church and grounds by the mid-1950s. 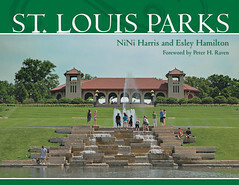 But by the 1970s, south St. Louis' ethnic makeup was beginning to change again as middle-class whites fled for the suburbs. Blacks, and Asian and African immigrants and refugees took their place in the 1980s. The dramatic demographic shift during the 1980s and '90s created social tension and demanded a response. In the '90s, parishioners were mobilized to advocate for social change, a value still held today. 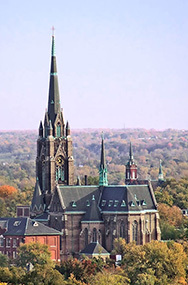 If St. Pius' members are fewer today, they are more diverse - a mix of old, young, refugee, immigrant, longtime neighborhood residents and suburbanites. In the '90s, the 10 a.m. liturgy became more vital with warmer hospitality, livelier music and more dynamic preaching. St. Pius' ministries to the elderly, homebound, immigrant and poor grew. Parish finances were stabilized; stewardship was emphasized. As St. Pius neared its centennial, it took the painful step of closing its school and merging with another in 2003 to form St. Frances Cabrini Academy. 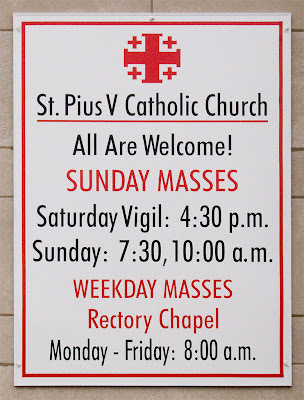 In late 2004, St. Pius learned it would close as part of a realignment of south-side parishes. 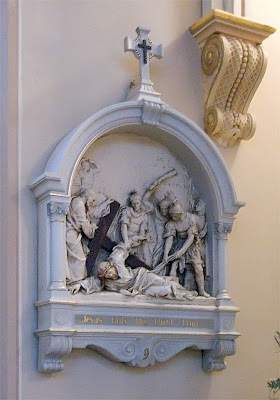 The parish strenuously defended its viability and purpose and the archbishop allowed it to remain open. 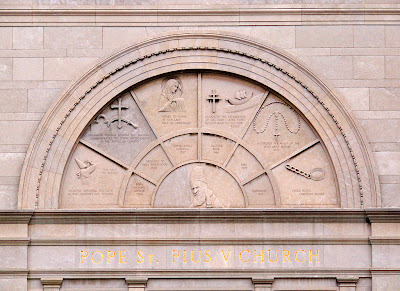 A century after its founding, St. Pius V finds itself at a crossroads. It must grow in numbers and continue proving its purpose, or risk being shuttered. 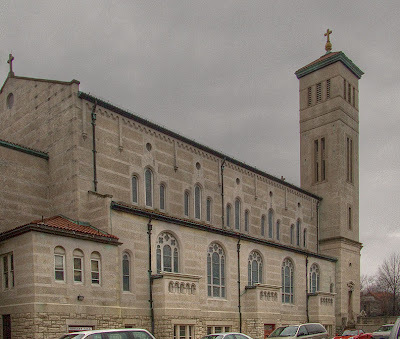 It remains one of the smallest territorial parishes in south St. Louis and made only a small net gain in membership from the recent parish consolidations. St. Pius must seize the opportunity to demonstrate it was the right choice for staying open and attract new members from the city and suburbs. What a shame! I thought the wrecknovators were somewhat checked in St. Louis, but I see they did their dirtiwork here in what is otherwise an magnificent church. 1. 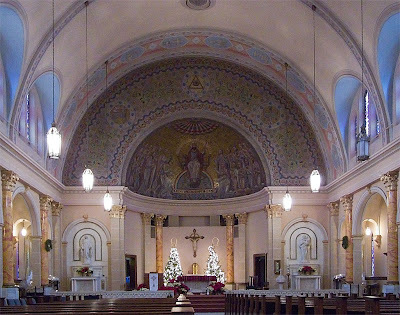 Did you find the mosaic of the all seeing eye odd in a Catholic Church, especially one built 100 years ago??? Seemed like a Masonic symbol to me. 2. 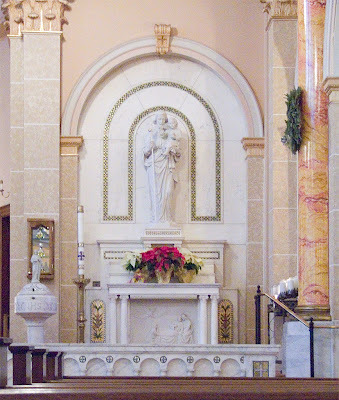 I realize the high altar has disappeared, the original pulpit changed, and some space added on the side for the choir. However, I find the curmudgeon's statement odd, especially in light of the focus of your photos. I thought the parish had done a really good job of keeping things together. 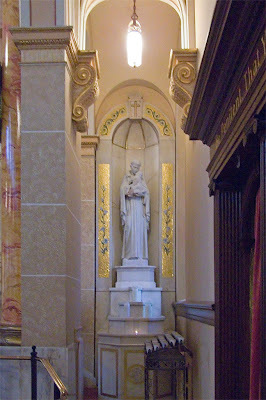 The tabernacle (although high altar removed) remained centrally located. The side altars were all intact, including tabernacles. 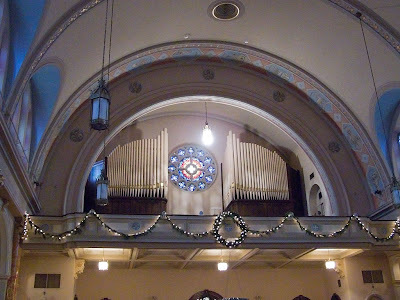 The confessionals, mosaics, and original organ were all left untouched. 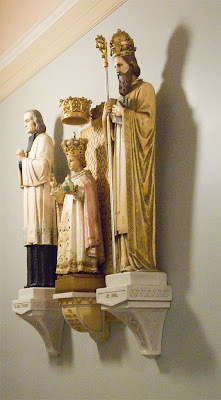 Overall, it seemed like it had faced very little wreckovation, other than the removal of the original high altar. What are your thoughts on the curmudgeon's observations? 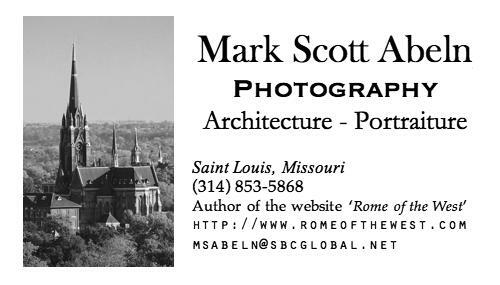 The all-seeing-eye was likely Catholic before it was masonic. It is one of the symbols corresponding to the "O Antiphons" prayed during the last week in Advent. Well, his name is 'Curmudgeon' so you'd expect him to be curmudgeonly. Artistically and liturgically, I think that we run into trouble when when try to identify the bare minimum requirements, and then make that the standard. Ontologically that is fine, but we are human beings who appreciate beauty as a part of our nature, and minimalism, as an aesthetic, only goes so far.